Some creators of full mesh bodies provide Mesh Development Kits. 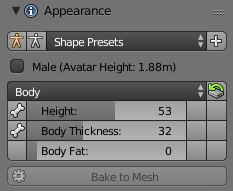 These kits typically contain Reference Meshes and reference weight maps for the developing of body attachments (clothes). If the development kit already comes as rigged to Avastar then you are already done. This guide is about how to fully integrate the development kit meshes into the Avastar Rig. Brief instructions for a safe integration. I assume you got the Developer kit in some readable form, e.g. as .obj (Wavefront) or .dae (Collada) file or even as ready made blend file. I also assume that your model has not yet been rigged to Avastar. 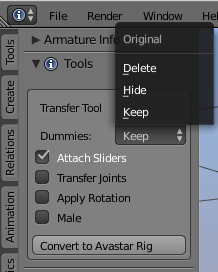 If the development kit is rigged to another (non Avastar Rig), then you can continue on the next paragraph Migrate from foreign rig or just unbind the mesh from the other armature, delete the other armature, and continue here. If your developer kit contains a full character, then you probably want to create only the Rig. But you are free to create the Avastar meshes along with the Armature. In the Appearance panel locate the Shape presets. There you see 2 stickman icons, one orange, one white. Select the white icon. The white Stickman icon puts the Armature into SL Restpose. This is what most Foreign Development kits support. Note: This tool is a bit finicky. If you find it not working out of the box, then please send us a ticket with the blend file that could not be transferred to Avastar. If the automatic transfer does not work, then you also can try to unbind the meshes from the armature, then proceed as explained at the begin of this document.